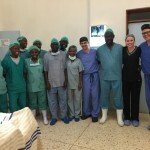 Dr. Isaac Moss and Dimension Medical’s Sean Murphy reflect on their experience on their last day in Kenya in an open letter to former NSF President, Bryan Cornwall. 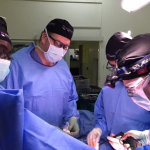 Together with Dr. Douglas Orndorff, Matrix Medical’s Justin Rangel, NuVasive® shareowner Lindey Gideon, and NSF ambassador Pitchou Malaba, the team operated on 18 patients in just 4 days at Kenyatta National Hospital. As we travel home, we have been reflecting on what was an unforgettable and eye opening week in Kenya. The experience has truly left a mark on our individual perspectives and will certainly have an impact on our daily outlook going forward. Going into this trip over a week ago, we shared how we were both excited and somewhat apprehensive about the trip — due to the instability in the world, as well as the unknown of heading into a third world East African country. Upon arriving into Nairobi, we were in awe of the sheer number of people about and the “organized chaos” as we navigated our way out of the airport. After Pitchou’s warm welcome (and a few Tuskers) the reality of the environment and the work to be done set in; melting away much of our apprehension. Immersing ourselves into the Kenyan healthcare system was both sad to see the lack of resources, and inspiring to see what the doctors, nurses, and staff have accomplished with so little. While we, in the US, are asked to do more with less, at Kenyatta National Hospital and the National Spine Injury Hospital they do an amazing amount with next to nothing. We were welcomed into a foreign operating theatre with warmth and an impressive level of professionalism from the entire team, including doctors, nurses, residents, and even the kitchen staff. Throughout our week, operating long hours on 18 patients over a short four days, the staff stayed late and never lost the smiles on their faces we wish we could say it would be the same in the US. This was a wakeup call and a reminder of why we work in healthcare —to help other humans, a basic fact that is again something that gets easily pushed to the side in the bureaucracy of the American healthcare system. We are returning home knowing that there are at least six individuals who were likely to be confined to a wheelchair for the rest of their lives and now have a chance to walk and hopefully lead happy and productive lives. The appreciation we felt from our patients in Kenya was incredible, both before and after their procedures, despite their own fears of the surgery and recovery that lay ahead. This will travel back across the ocean with us and will rejuvenate our professional and personal satisfaction in our work. Leaving here, we realize how blessed we both are in many aspects; as it relates to this experience, we are truly blessed to have met you. It was you, Bryan, who has helped inspire us. You are a beacon of light in the world – a person who is always there to lend a hand. 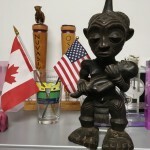 With this in mind, we would like to present you with the enclosed “mother and child” Masal carving. To us, this represents what both you and the NuVasive Spine Foundation™ has been to so many. Asante Sana! Kindest Regards and Best Wishes in the New Year!